For reasons much like those behind the various Cyber-Types, no sooner had Doctor Who unleashed the Daleks on the world than they started dreaming up variants - while the original "The Dead Planet" had presented them as a bunch of insane scientists and just assumed that they knew which of them was which (or not - they were insane, after all), "The Dalek Invasion of Earth," with its purposefully military Daleks, began the long and hallowed tradition of slapping some paint on one of them and calling it the boss. And the merchandisers rejoiced, since they just love an excuse to sell us the same toy over and over again. One can only assume that "Victory of the Daleks" gave Character Options a full-on profitgasm. "We are the paradigm of a new Dalek race. Scientist, Strategist, Drone, Eternal, and the Supreme." "Which would be you, I'm guessing? Well, you know, nice paint job." 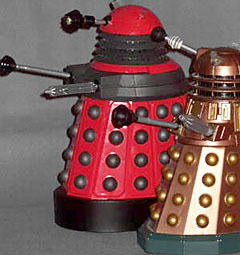 Although the Dalek-in-charge (often nicknamed the Black Dalek) was more or less a constant, under various names and resprays, other Dalek types have come and gone according to the whims of the day's writers - the new Daleks (new new Daleks, from the perspective of classic Who fans) were introduced, as above, with their types and colour-coded-for-your-convenience looks all provided up front, presumably in the hopes of making this hierarchy stick more than one episode. Dubbed either "Progenitor Daleks" or "Paradigm Daleks," depending on who you talk to, the new breed are a Power Rangers ensemble, with today's red Drone being the first to get his own toy (the others, you can imagine, are swiftly following). While it may at first look like newly-installed Who supremo Steven Moffat got carried away making his Daleks bigger and brighter than his predecessors, the idea behind his and the props team's work is actually more nostalgia-based. Back in the day - 1965 and '66, precisely - two movies were made to cash in on Dalekmania, with scripts based on (i.e. virtually ripping off) the first two televised Dalek stories, reimagined as Dr. [sic] Who and the Daleks, and Daleks' Invasion Earth 2150 A.D., starring Peter Cushing and sporting a lavish range of technicolour-endowed Daleks, taking advantage of the silver screen's monopoly on colour. These boys today? Direct spiritual descendants, for though fans are rightly scornful of the derivative plots and continuity-ignorant alterations (no, really, his name was "Dr. Who"), the old AARU films nonetheless are regarded with an aw-look-they-didn't-really-know-any-better affection. 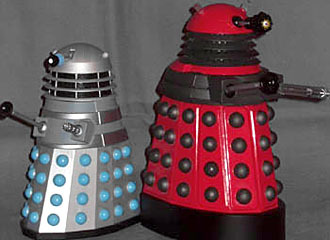 Along with their United Colours of Skaro paint jobs, the new Daleks also inherited the movie-Daleks' stature, coming in at just under 6" in toy form, topping both the Doctor Who line's average human, and their own predecessors, and they're not shy about out-bulking them, either. While classic Daleks are more or less just as big as they need to be to contain a prop operator on a little tricycle, whoever designed the shells of the Paradigm models obviously wanted their operators to have room for en-suites and minibars in there as well. The tall base - another AARU artefact - measures over 4" from stem to stern, and there's not a lot of tapering going on between it and the weapons platform (which, without the "solar panels," is actually a throwback to the original "Dead Planet" Daleks, which should please the purists) above. Indeed, one of the first things you notice about the Drone is how his neck and head seem a little dwarfed by the rest of him - kind of like he's been at the Dalek steroids. While the previous Daleks' copper shells were aimed at a more toned-down, real-world aesthetic, the new breed - riding high and confident after years of new Who success - simply do not goddamn care, and are luridly bright and shiny. The Drone's paint job is based around a suitably glossy fire-truck-red paint job - a little on the orange end of the scale (though not so much as the camera makes it seem), but fairly central on the palette of reds. While the base is plain black, the other contrast segments, the neck and weapons platform, are a matte-finish gunmetal grey - as mattes are wont to do, scratching is a danger, but though my Drone has a little mark on its collar, I've seen several in store, and haven't yet spotted any egregious damage in the packaging. Be careful removing them, though. 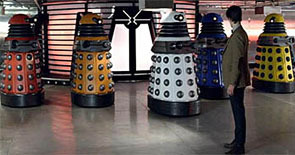 The bumps (sensors, self-destruct globes, whatever it is that they do this week) are the same grey - only on the Dalek Eternal (the yellow one) are they pure black, either as a clue to some subtle difference between the Eternal and its stablemates, or because the props crew thought it looked better that way. There's not a lot to say about the head - glossy red, clear "ears," job done - but what with it being the focal point of what passes for a Dalek's face, the eye stalk has come in for some attention. 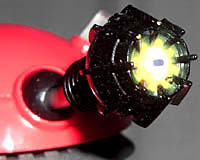 As with the colour scheme and overall design, it's obvious anyone who suggested "tone it down" was thrown out of the office, and the old flat-fronted ball with a light in the middle has morphed into an eight-sided blade-edged monster with a simmering furnace inside it, to judge by how the "glow" looks. 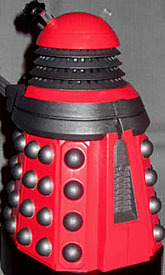 As with earlier Dalek toys, the paint job is valiant, but falls short due to the sheer impossibility of the task of duplicating the effect - the yellow-orange gradient, with its gloss finish, behind a black and white central eye, is good enough to pass muster, but short of what you see on TV. One thing that hasn't changed for Team Skaro is their articulation - it's balljoint arms, swivel necks, and tilting eye stalks, just as before. While the eye may look like it's on a balljoint of its own, there's no lateral motion there beyond the play in the joint's plastic - none needed, of course, since that's what the rotating head is for. Falling roughly under the subject of articulation though, the wheels hidden away beneath the skirt are a new layout, with three free-turning trolley wheels, rather than the rear pair being fixed as was the case with Character Options' previous Daleks. Being trolley wheels, rather than just spinners with the turn axis directly above the axle, they still have a tendency to keep trundling forward rather than skew off in any direction - although (on a suitable surface) once you do get them going sideways, they'll stick to that direction just as well. 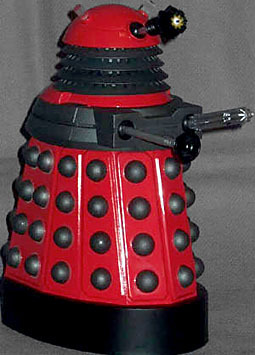 The new Dalek design - while eminently justifiable on the show - is paradise from a marketing perspective, and while the Drone led the way, the others aren't dragging their wheels in following; a blue Strategist is already available as a remote-controlled toy, in scale with the regular figures, a yellow Scientist variant isn't far behind, and I'm told the inevitable five-Dalek boxed set won't keep us waiting long. I'm an enthusiastic collector of the Character Options line, but I have no intention of amassing a Dalek army for its own sweet sake - one of each will do. And while they will just be five identical toys with a single paint variation (or two, for the Eternal and its weird bumps), at least I can be assured from the Drone's example they'll be five good toys.